The children of the Grace Field House orphanage have their happy lives upended when they find out they’re being raised to be fed to demons. Can they escape their fate before it’s too late? With Norman scheduled to be shipped out, the children try their best to save him. Emma and Ray come up with a new plan, but then Norman makes a surprising decision. 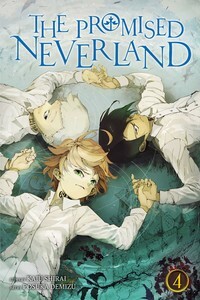 Story by Kaiu Shirai and art by Posuka Demizu.